Waterfall has taken a back-seat. It's all about Agile and Scrum, and in this new environment of Scrum teams, everyone is responsible for testing. Quality is no longer an afterthought, and testing has become an inherent part of every stage of the user story development. It's a new age, new time, an exciting rebirth for the tester. Testers today are required to focus on everything: they are expected to know a lot more today in order to keep their jobs. 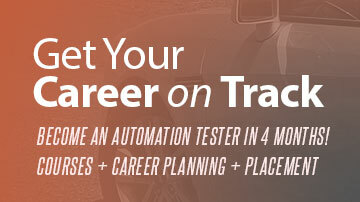 It's time now to remove the manual testing shackles and join the world of automation and TrainingRite will be there every step to help you make your learning easy. Whether you are just getting started with BDD or an experience software tester, this course will teach you everything that you need from a testers perspective as how to automate and write excellent scripts using Ruby Cucumber RSpec with Watir and Capybara, right from setting up with installations to creating automated scripts using everything as discussed below. First and foremost OUR STUDENTS GET JOBS after successful completion of our training PERIOD. Our Assignments prepare our students for the real-life scenarios. Excellent Guidance for the interview process. You will be READY to PERFORM on Day ONE at your new JOB. Complete course material including script/code samples and walkthroughs Access Your Front Row Seat: You feel like you are in the classroom one-on-one with the instructor. TrainingRite.com uses industry leading Conferencing Software [with integrated VOIP] to provide training. Get the Best Training & Pay Less: TrainingRite offers the best software testing training anywhere at an affordable price. No travel expenses. No being away from the office. Courses start as low as $99/month!